Bob and Ben speak with Jeffrey Engel about the history of Presidential impeachment and how understanding the past can inform the debates surrounding the impeachment of current and future Presidents. Jeff explains the reasons the delegates to the Philadelphia Convention in 1787 chose to enshrine impeachment in the Constitution, how the process works, and what they meant by “other high Crimes and Misdemeanors” (it turns out that last part isn’t as vague as you might think). He also talks about the reasons for the impeachments of Andrew Johnson and Bill Clinton, why Richard Nixon was so close to being removed from office when he resigned on August 9, 1974, and why Nixon and Clinton’s decisions in the face of impeachment might have a lasting effect on American politics today. 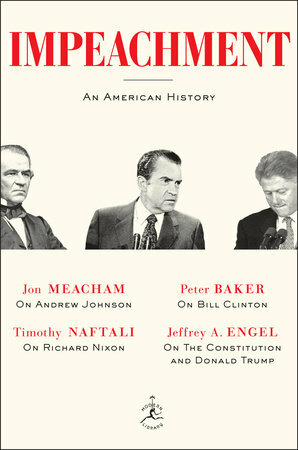 Jeff’s new book Impeachment: An American History, which he co-authored w/ Peter Baker, Jon Meacham, and Timothy Naftali is out from Modern Library on October 16, 2018. Dr. Jeffrey A. Engel is an award-winning American history scholar and director of the Center for Presidential History at Southern Methodist University. He is an expert on the U.S. presidency and American diplomatic history. You can follow him on twitter at @JeffreyAEngel. This episode was recorded on October 9, 2018 and was edited by Gary Fletcher. A special thanks to Dr. Brandon Miller of SMU’s Department of History for connecting us with Jeffrey Engel.